I will praise the Lord no matter what happens. I will constantly speak of his glories and grace. I will boast of all his kindness to me. Let all who are discouraged take heart. I shared a meal recently with someone who just needed to talk. She admitted that her heart had shut down. One storm after another had overtaken her but for a while she believed things were manageable. There was more right than wrong so she stayed optimistic. She believed in her natural problem solving skills. Eventually though, things fell apart with most every family member. She wept as she admitted that she had lost her voice, lost her hope, and lost her fight. What’s missing from this picture is a mention of God. Prayer, faith, and strategy, are absent. It’s not that she doesn’t know God. She does, but her prayers are way too sporadic. Passivity means that she has abdicated the outcome to stronger forces she doesn’t have the will to fight anymore. When the enemy comes in like a flood, I don’t have to stand back and wring my hands over the invasion. When sickness overtakes a family member, I can do more than watch. When bad news is announced, I can do more than listen. When sin dominates another part of the house, I can do more than worry. When a family member succumbs to depression, I can do more than offer platitudes. When the bank account is depleted, I can do more than expect destitution. God will raise up a standard and He will use me to be His temple of faith and praise. If you’re lying down because you feel hopeless, get up. If you’ve lost your voice, get it back. If you’ve stopped praying, fall to your knees. The language you need is the language of the scriptures. If you have a mouth that can read the Word of God out loud, you’re not wordless. No home need permeate darkness when praise music plays twenty-four hours a day. No mother need cry herself to sleep with hopeless tears when God gives her scriptures to address every single thing that assaults her household. 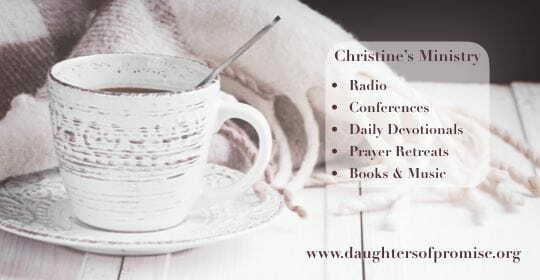 God’s daughter is meant to walk the house and pray scripture out loud. She does it in the morning. She does it again at night. Her faith is revived as she speaks God’s promises. They are the battle cry that declares war on God’s adversary. What happens when the enemy hears her scriptural pronouncements; when God’s Word assaults his ears? His schemes are threatened. He is reminded of his limits and flees. Know this ~ he will try to re-group, only to be met again with the the child of God who knows that the secret is persevering. Let that be you. Have a word ready for his next act of aggression. Is everything you've read merely an attempt to give a good sounding pep talk? No. I’ve lived long enough to experience life falling apart on many fronts and, oftentimes, it happened all at once. There were periods when I capitulated to a serious depression. But somewhere in the night, there was an infusion of faith and God tutored this child to learn strategy and warfare. The turnaround didn’t happen all at once. His Word drove out the despair like the slow drip of a life-giving IV and it revived me. What I thought I needed to tolerate became history. God’s glory came to rest but not without my full engagement and cooperative effort. There’s a reason scripture trembles in my hands. It’s wonder – not fear. Let me pass along my well-founded confidence to you. It is a gift from someone who once lived in the pit of nothingness.